The Perfect Chelsea Christmas Present!! 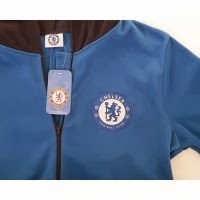 Christmas is coming and have you ever thought about a Chelsea Onesie?? It's the perfect present for the Chelsea fan you know this year! All our products come complete with the Love My brand label and include official swing tickets and holograms you would see in the clubs own stores. Love My are the original innovators of football Onesies. Our products are 100% exclusive and our official products are unique to our site and the Love My label. All our Onesies are manufactured from a high quality 240 gsm Micro-fleece. Not only is this warm and comfortable to wear, but also ensures our customers are guaranteed a quality product that is great value for money. In addition - Love My are now offering FREE DELIVERY AND FREE PERSONALISATION on all Adult Onesies! Love My are the original and best…Beware of cheap polyester imitations! Click here to have a look and order yours now!